STARRING Peter O'Toole, Samantha Morton, John Lynch, Peter Dinklage, Jemma Redgrave, Steve Pembridge and Gregor Fisher. SYNOPSIS Just before World War II in the small mining town of Greenhall Bridge, times are getting tough. But through the gloom of the mines, Lassie the beautiful Collie is known to all. Not least to the local wealthy aristocrat with a passion for dogs and getting what he wants. When the mine closes, the Carraclough family feel the pressure and Sam Carraclough is forced to sell his son's beloved dog. 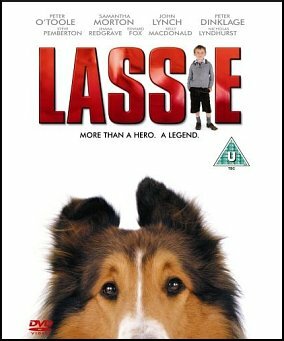 But will Lassie accept a new home?